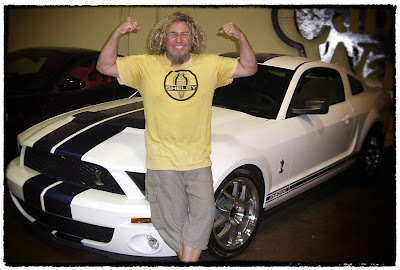 Red Rocker, and car collector, Sammy Hagar is selling his Shelby GT500 Coupe 2007 Mustang and wants a fan to own it. Shelby GT500 Coupe 2007 Mustang, V8 Supercharged 5.4L engine, manual 6 speed transmission, cruise control, power steering, tilt wheel, premium sound with Shaker 1000 audio system, power seats, leather, rear spoiler, alloy wheels, premium trim package with Shelby Blue tape stripe. The car has 2,920 miles on it, and is available for $36,000 on a “first come, first serve” basis. Hagar is adding some extra value to the package. "I will autograph the car and throw in some goodies!”, including a trunk full of Red Rocker memorabilia. The buyer can pick it up for an in-person handoff of the keys from Sammy. For more details – including how to present your offer – visit Sammy’s website here.